Home Conspiracies 9/11 Conspiracy – what really happened to the lamp posts at the Pentagon? 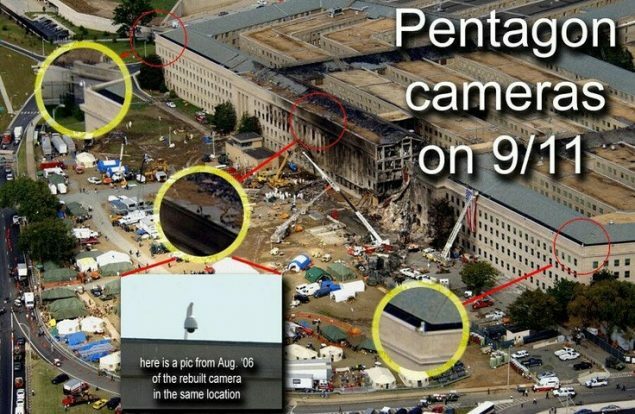 9/11 Conspiracy – what really happened to the lamp posts at the Pentagon? 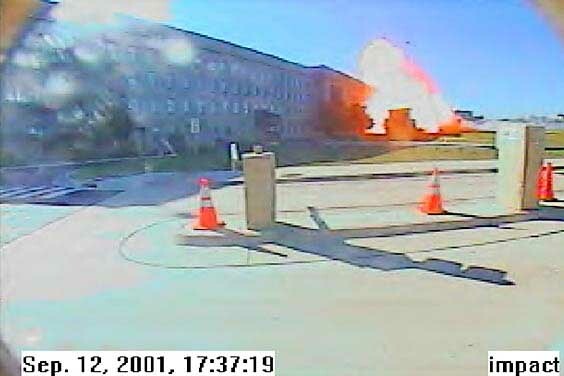 On September 11th 2001 American Airlines flight 77 crashed into the side of the Pentagon, arguably the most protected building in North America. Despite the dozens of external CCTV cameras covering the building, not one single image of the plane has ever been published. The only frames released of the impact on capture just a flash of flames and smoke – no plane. The official story is Hijacker Hani Hanjour made a 270° corkscrew diving turn into the pentagon with Flight 77, a 125 feet wide Boeing 757. This reached around 800 km/h and knocked down 5 light posts as it approached the Pentagon before crashing directly into the south face, creating a 16 feet wide hole. It should be noted a number of experienced professional pilots expressed doubt that they could have managed the maneuver that Hanjour is alleged to have carried out. All CCTV footage of the event was confiscated by the FBI for reasons of “National security”. After some delay, a single camera’s footage was released, and although a fireball is visible, a 757 is not and the video is missing a frame. In 2006 hotel security camera video footage was released by the U.S. government that showed the explosion that followed the crash of American Airlines Flight 77, the low-quality recording did not capture an image of the 757 jetliner. The official report contends that the plane came in low and level along the south side of a CITGO gas station and hit a number of light poles on its way into the Pentagon. These fallen light poles have been well documented – but this causes an issue! The dozen of independent eyewitnesses interviewed placed the incoming plane on the north side of the CITGO gas station as it approached the Pentagon. So what caused the downed light poles? 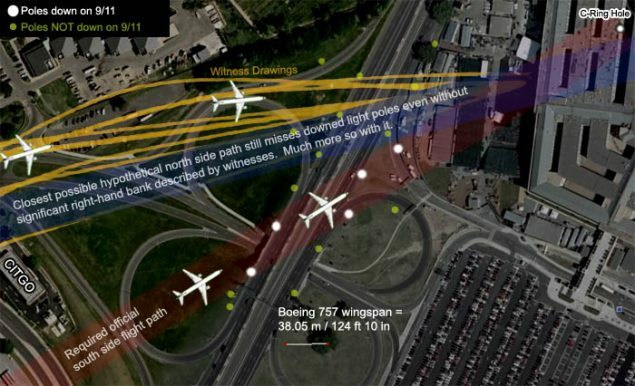 The large Boeing 757 would have taken a flight path over one of the most highly populated business areas of Arlington – during office hours. Very few witness came forward to support the south approach claim. Not only has the government refused to release footage that would clearly show how the Pentagon was attacked, it has also seized footage not belonging to the military.